I quote Chabon here because I think this is what When Jews Were Funny devolved into by the end of it. What started as a film trying to untie the thesis, “Are Jews naturally funny” or “Is American humor really Jewish humor” by the end waves its arms in the classic “I'm drowning “ sign and turns into Alan Zweig questioning various Jewish comedians about how he should raise his daughter – he being sixty and she being four years old and born from a non-Jewish mother. As you said so well, Elkin, this movie loses its thrust. Midway through it starts being about them and starts being aboutme. My insecurities, my confusion, my struggle with being Jewish. In the end it's all about my angst rather than abouttheir angst, their struggles, their insecurities. Zweig veered too far to the personal and too far from the universal. He moved from the objective to the subjective. 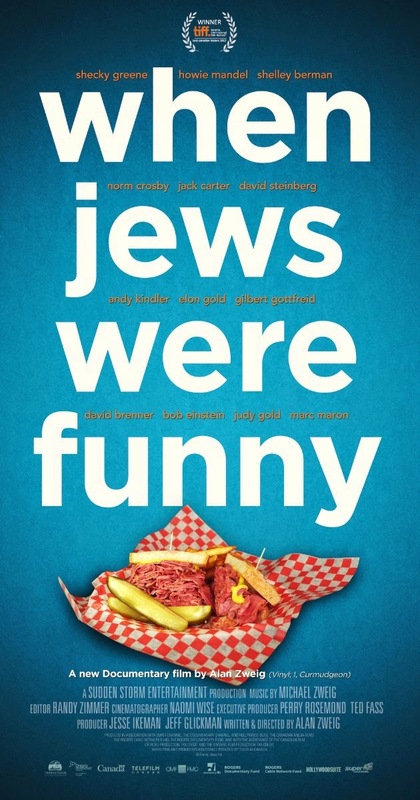 So is American comedy infused with a Jewish sensibility? Well, yes. At least it was. When I was growing up, comedians set up jokes. They pointed out the absurdities of existence, commented on inequalities, and deconstructed commonly held beliefs – be they religious, political, or social constructs. While this kind of humor is still around, you see it in things like the Daily Show or Louis or Arrested Development, a new type of humor has really begun to supplant intricacy and go for the sardonic sneer. Facebook, Tumblr, 9GAG, and Cheezburger are awash in visual oddities juxtaposed with a quick ironic commentary that, bereft of context, is as ephemeral as our attention span. We're all about memes and amirites nowadays, and while these sorts of things can make you smile, they hardly ever make you think.